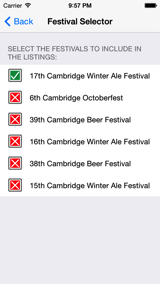 It’s that exciting time of year; you’ve just heard the Cambridge Beer Festival has released its drinks lists, you’ve had a quick look on the website and it looks amazing – so your priority is to start updating your wish list on the iPhone app. But how do you update the iPhone app with the latest data? It is really simple, and there is no need to download a new version from the app store. The existing app will update automatically, but if you need a helping hand, the steps below walk you through the process. Launch the app. 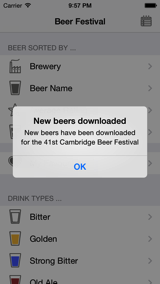 If this is the first time you have run the Beer Festival app, you will see a progress indicator whilst the app sets itself up for the first time. If you have run the app before, then this step will be complete and you will see the standard menu when the app launches. To see which festivals the app currently knows about, open the menu and select the Festival List. You will see a screen similar to the one shown on the right. On this screen, you can select the festivals you are interested in, and the app will reflect drinks from your chosen festivals. Multiple festivals can be selected if you wish. At this time, the app has not downloaded data for the forthcoming festival. Once the app is running, ensure you have a good data connection, and the app will automatically send a request to our database for the most recent data. This usually happens within 20 to 30 seconds of the app starting, but if the request fails, then it will retry 10 minutes later. See below for instructions on how to force an update sooner. Whenever the app downloads data for a festival for the first time, a pop-up will give you the good news (as shown here)! Subsequent updates (e.g. the Cider or Foreign Beer lists, typically available nearer the festival) will not show this. Step 4 – Check out the new beers! When the app downloads data for a festival for the first time, it will automatically select that festival in the festival list. You can see this by looking at the Festival Selector list again. 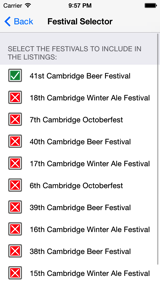 Now you can see that the app has downloaded data for all of the recent festivals and in the example here, automatically activated the 41st Cambridge Beer Festival. Clicking on one of the display modes (e.g. beer sorted by brewery) will now show you data for the forthcoming festival, and you can start adding the beers you want to try to your wish list. Enjoy! Most importantly, double-check you have a reasonable data connection. This is the cause of most update failures. If the app is running, it will check every 10 minutes for updated drinks data. Ratings and drinks availability are updated more frequently. The app will also check for any update when it is started, however this is only done if the previous update was more than 10 minutes ago, so simply going to the home screen and back into the app won’t necessarily cause an update. 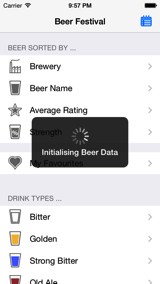 Similarly, pulling down on the main menu will only update data about the drinks the app already knows about. If you want to force an update, then killing the app and restarting it will ensure that an update is performed immediately. To kill an app completely, double-click on the home button, and swipe the CBF app upwards off the top of the screen. This kills the app completely. When you re-launch it, a new update will be started within a few seconds of the app starting.